As my wife and I sat around our home and thought about how to spend a gorgeous day together here in the Coachella Valley, one thing came to mind - The Spa Esmeralda. What better a place to share some time, some moments and the opportunity to relax in tranquility. The Spa Esmeralda is a sanctuary entered into that was conceived to arouse our senses and separate us from the cares of everyday. Designed with smooth marble floors, gleaming glass and tile, sculpted wood, plush furnishings, textural fabrics and soft linens, floral bouquets of fresh garden scents along with the soft, tinkling music of a trickling stone fountain, this place smelled of relaxation as me and my wife entered through the doors. One of the features listed on the extensive menu of services that we both came across was Couples Treatments. Time to take breath, lean back, close the eyes and let our bodies come alive as the California spa resort soothed away the stress of the day, or the year, amongst a blissful garden setting that was surrounded by an alluring desert landscape. The Spa Esmeralda provided us an exclusive selection of Spa Couples Treatments that was both intimate and revitalizing. We were able to choose from a menu of treatments all specifically designed to appeal to both sexes. From stimulating massages to skin treatments to scrubs, manicures, pedicures, facials, bathing to other specialties all presented before our eyes to choose from. We sensed that our treatment time in the Spa Esmeralda was provided amongst an intimate sanctuary that allowed both her and me the opportunity to reconnect through the shared sensation of complete relaxation and wellness. As we perused the menu, the Must Love Chocolate - Couples Massage caught our eye quickly. With this we were to share a 60 minute Esmeralda Signature Massage in one of the beautiful couples suites. After the massage, we were to enjoy a Chocolate Molten Lava cake along with either a glass of champagne or sparkling cider out in our cozy garden cabana. And this was all for only $249. As tempting as that sounded, we instead decided to start with the Couples Massage that allowed us to create our own custom couples massage experience. 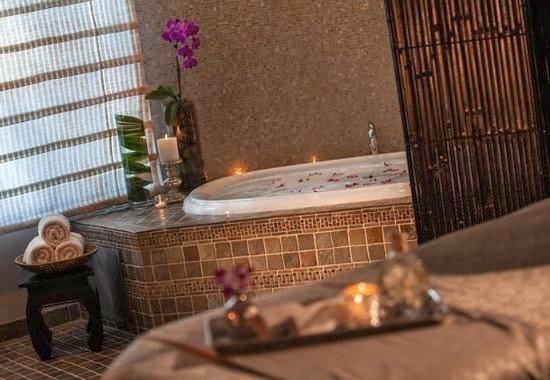 We selected two massages other then Stone which included Esmeralda Signature, Therapeutic Sports, Reflexology or Mellow Mama, and received them together in our luxurious private spa suite, side by side. We even held hands as other hands rubbed the daily grind away. With two therapists and two tables, we relished in the romantic experience for 60 min, but we had the option of 90 minutes also. There is also a Couples Retreat which began with our therapist who prepared a private aromatherapy bath were we were able to play in the mud and take in an interactive facial mud mask. Our gorgeous treatment sanctuary was adorned with pink, red and purple rose pedals while we enjoyed a relaxing massage. We were also given the option of experiencing the treatment in the Spa Esmeralda's Outdoor Spa Garden and enjoy the desert sun in our very own private cabana as long as weather permits. We wrapped up our full day at the Spa Esmeralda together with the Floral Ritual for Couples. We sat side by side and slipped our feet into a lovely foot bath that was filled with an herbal infusion. Our feet were cleansed using salt and essential oil exfoliation then they were each lightly massaged with healing botanicals. The 30 min foot bath was followed by a 60 minute body massage that completed the experience. The Spa Esmeralda provided my wife and me with the opportunity to get close and enjoy a variety of relaxing techniques together that only assisted in the nurturing of our bodies as well as our care for one another. 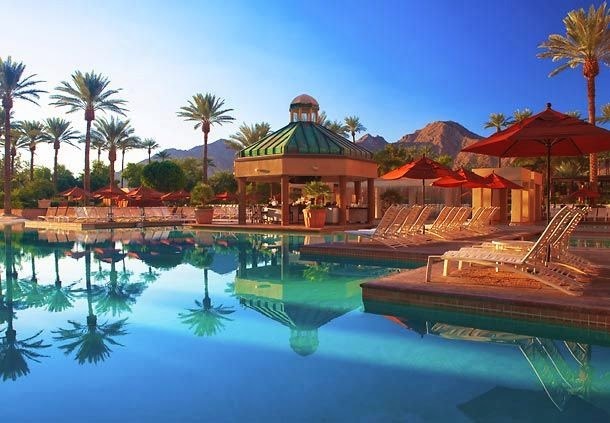 For discounts and deals on hotels, restaurants, and attractions in Palm Springs, CA, visit http://www.palmspringsvacationdiscounts.com/.